What are the best by-pass fats for dairy cows? Use a by-pass fat type that will not suppress Dry Matter Intake (DMI). C 16 fat supplements will sustain DMI, and as such will promote greater overall energy intake with fat use. Calcium salts of palm fat are more likely to depress DMI. By-pass fats with high C16 + some C18 is the tool to maximise milk volume and solids yield response in the vat without costing any extra body weight loss. Bergafat Premium is such a product. By-Pass fats with medium C16 + a bit more C18 will optimise body weight regain but will produce a lesser uplift in the vat. Bergafat Classic is such a product. The best by-pass fat for dairy cows is therefore dependent upon your aim and stage of lactation. We will outline below the details about the best by-pass fats for dairy cows in relation to Australian and New Zealand dairy rations. Is it about promoting Milk fat yield? Let’s start by saying we do not think that the milk solids uplifts from fat use can really justify (alone) the investment. Typically, only 20-30% of the by-pass fat we put into the diet ends up in milk. As such the use of by-pass fats for extended periods across lactation based on solids yield benefit alone is hard to justify economically (unless this helps you avoid penalties for low fat levels). Therefore, use is more tactical, it is about tactical energetic manipulation and fatty acid delivery, with a reproductive goal mainly. Is it about managing energy balance, and thus reproduction? With that repro in mind we want best overall daily capture of energy/cow/day. This must account for alterations in DMI as well as by-pass fat and other diet outcomes. We can’t just assume that extra 5-10MJ from 200-300g fat supplementation will all be additive to existing intake. As we increase energy delivery with by-pass fat, we should ensure we do not impede DMI. Some fats , i.e. the calcium salts of Palm fatty acids, are not fully rumen protected, and release unsaturated fats into the rumen that can tend to depress not increase milk fat yield. This depression in fat yield, and the energy thus spared, may in fact be the very reason we get reproduction benefits. Our position is that such an outcome is a bit two edged. To loose income from milk solids in order to gain reproductive outcome is not a win win. Importantly in achieving these aims, we feel by-pass fat application is NOT for recently calved fresh cows. Fresh cows are already dealing with fat as NEFA, so excess fatty acids are already affecting the liver/physiology. Supplemental fat just adds to this pressure. This is one of the key reasons that fats in fresh cows typically depress DMI ( Hepatic oxidation) but are less likely to affect cows as we move towards peak milk and mating period. By this time NEFA flow has subsided, the liver is able to get on with glucose production, ureagenesis and so on….and by-pass fat can be processed to energy with little negative impact. Glucogenic energy sources promote insulin and thus slow body weight loss. Fat supplementation is more related to Insulin suppression, so may not assist in slowing body weight loss as we would prefer. As we aim to increase energy delivery, we MUST NOT impeded DMI. 2 . Ca salts vs saturates? Let’s start by laying out that Calcium salts are only 80-85% fat to begin with, so the fat and thus energy delivery is only 80-85% of a fat supplement that is 99-100% fatty acids. That is a simple difference to start with. We think the energy supplementation will uplift greater with products that are energetically superior to start with. In addition, data suggests that Ca salts depress DMI more, which means overall caloric intake not so beneficial. 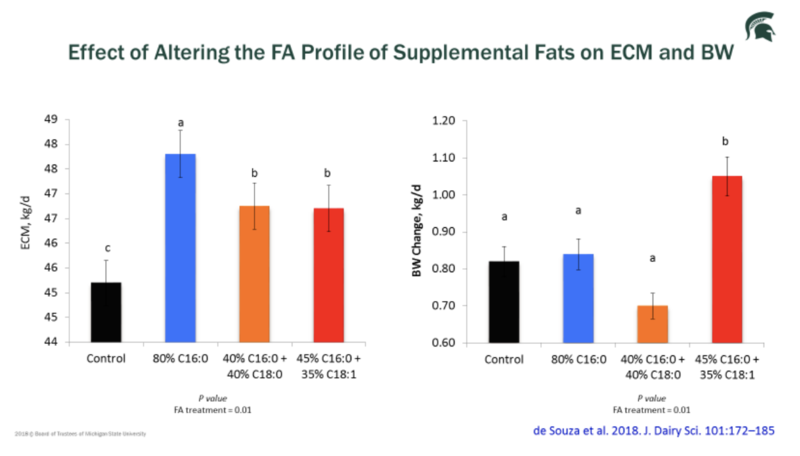 Early work that suggested that there were significant digestibility compromises with saturated fatty acids vs unsaturated has also more recently been shown not to be the case. It possibly related to early work when saturated fats were often essentially tallows, and may have had lower digestibility’s, but modern fractionated saturated fats such as c16:0 have excellent digestibility but are rumen inert as they have no double bonds. Bergafat style products have an equal fat digestibility to calcium salts of palm fat. Our local conditions also present circumstances that suggest not to use Ca salts e.g. with green grass containing lots of Poly Unsaturated fatty Acids (PUFA) of its own. The calcium salts may not be an ideal fit with that pasture PUFA. Reality is the Ca salts do not stay well “rumen protected”, it is common for 20% of the fat to release as PUFA into the rumen. With release of more PUFA in rumen, we make more CLA and more MFD risk (we create, not fix, milk fat depression!). Data Favours saturates of c16 to improve milk fat yield more reliably, whilst still supporting overall caloric intake daily. Both have similar energy values in theory , but recent work suggests that the digestibility of 18:0 is not as good as 16:0 . A further advantage of C16:0 is it seems to get to milk volume better and lift fat yield more, so some greater reward for use in solids yield in addition to repro/energetics gains. For us, it’s clear that a focus on 16:0 as basis of our products is sensible, but we recognise that a max 85% c16:0 is possible, as Prof Lou Armentano has shown above. We see a clear drop off in fat digestibility. 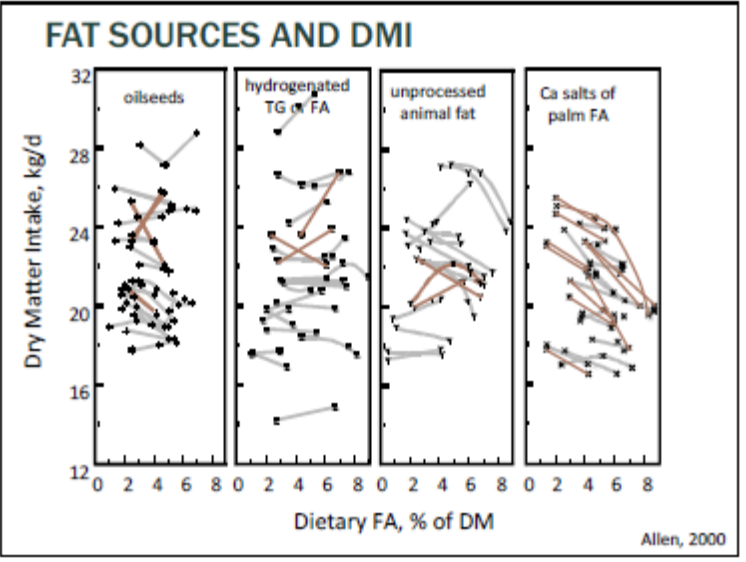 In the below comparison of different fatty acid types in the work of the Michigan state team under Professor Adam Lock. Compare the blue bars (85% c16:0) with the orange bars, with more c18:0. The blue bars are typical of our Bergafat Premium product, producing significantly extra milk above control, and not costing any extra body weight to make that milk. The more recent work of the Michigan state team under Professor Adam lock has shown the application of some c18:1 in addition with a back-ground level of c16:0. The Bergafat classic contains this style of fatty acid types (though not quite as much c18:1 as the red bars above, and a bit more c16:0). Using such a combination will increase milk yield above control, but not as much as the Bergafat premium. The extra energy is seen to partition more to Body weight change…gaining weight faster.